I flipped the Air Canada plan horizontally to try and get a similar angle. 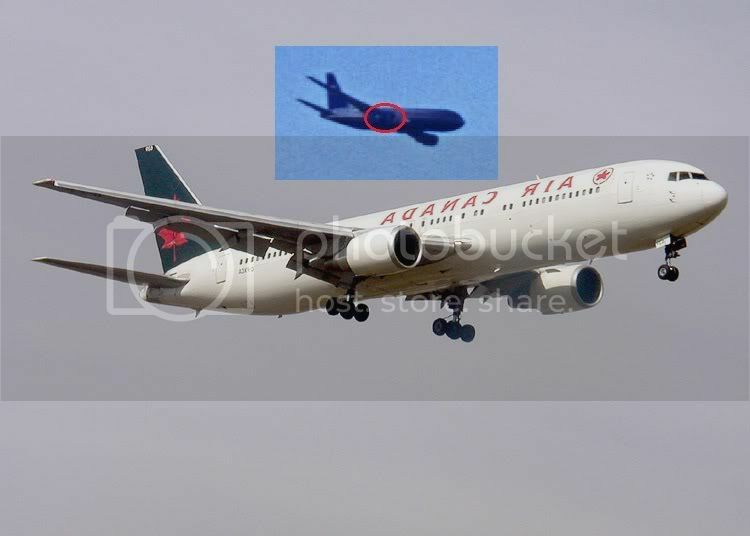 Looks pretty close to me as far as what we should see in the supposed "faked" photo. Indeed, and I can also see the row of windows along the fuselage. Granted I cannot see each individual pane of glass but there's almost certainly a row of windows present. No windows are visible anywhere on the cgi and most importantly on the front. It can't be a manned aircraft without windows.LOL It's fake beyond beyond belief, with a few looneys trying to defend cartoons. Someone needs to look in the mirror. That looks a little closer but the same problems remain. The right wing is not forward enough, and the right engine is not only not aligned with the left engine, but not even visible. The left engine is not straight forward but sagging a bit. You're the one not really a supporting a black plane with no windows. Last edited by 7forever; 07-10-2011 at 03:33 PM. So what in your opinion would account for the series of small darkened shapes, lined relatively neatly along the fuselage if not windows? the right engine is not only not aligned with the left engine, but not even visible. Did you seriously just write that?! How can you tell the right engine is not aligned with the left engine if the right engine ISN'T VISIBLE??? I guess this proves you are playing games and actually DO see the right engine. No windows? What's the "dark line" that the red arrow is pointing at? Last edited by skanny; 07-10-2011 at 04:34 PM. This mental lapse was SO good, I have no choice but to use it in my signature. You circled a smudge of black. You have nothing. It's nowhere near the size of the crippled left engine and is not discernible. You only have failed computer graphics to work with, hence, will always fail. Last edited by 7forever; 07-10-2011 at 06:20 PM. You've pointed at a black spot on a black plane. If either the monitor you use at home or your eyesight is unable to make out the (admittedly faint) sequence of windows on the image you posted then dare I say you aren't best suited to studying the authenticity of video and still images? I would also add your continuation of calling a plane of 2 shades of dark blue, black, would again suggest this is not your forte. Last edited by fanoftruth; 07-10-2011 at 06:22 PM. How can you tell the right engine is aligned with the left engine if the right engine ISN'T VISIBLE??? I guess this proves you are playing games and actually DO NOT SEE the right engine because there's nothing that even remotely resembles the left engine on the right side. Since the fake left engine is clearly looking retarded, the right engine has to be visible, but it's not. Last edited by 7forever; 07-10-2011 at 06:44 PM. 'Sagging a bit'? You don't think it's due to the plane being in a slight dive. I think you are either seeing what you what to see or the pictue quality on your screen is pump. Also, is it 'black' since it may have been in a bit of a shadow cast by the smoke from the burning first tower? And the engines seem to be in all the right places. And in the picture you posted, the lighter top side and dark under to the fuselage is consistent with UA livery is it not? Give it up. It's painful to watch. now people can see that forever is nothing but a wind-up merchant peddling clownish ideas with even more laughable responses. my sides are too sore from laughing .. keep em coming. Last edited by skanny; 07-10-2011 at 06:37 PM. Even I can see the right engine. No. Even the other plane posted doesn't show much of any space between the engine and the belly. It's sagging and looks more like a wing. Last edited by 7forever; 07-10-2011 at 07:04 PM. Circle it and compare it to the real planes. No right engine can match up. There is NO right engine because whatever it is, is too high and left of the right wing.LOL It's not possible to discern a right engine which has to be right of the body and right wing. It's all smudged and no person can point it out because it's just smudged in black. Last edited by 7forever; 07-10-2011 at 07:01 PM. 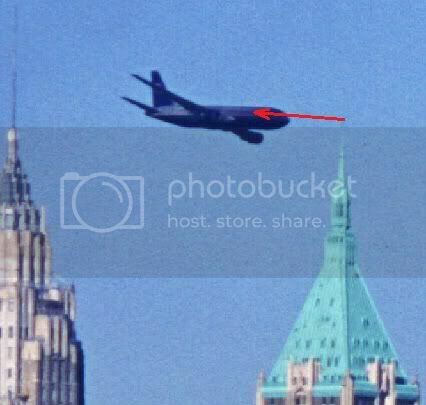 The dark line you've pointed to is an extended black line which proves nothing because it's a black plane, therefore impossible to discern any windows. You are trying to see something that's not there, or even possible to see with the human eye. 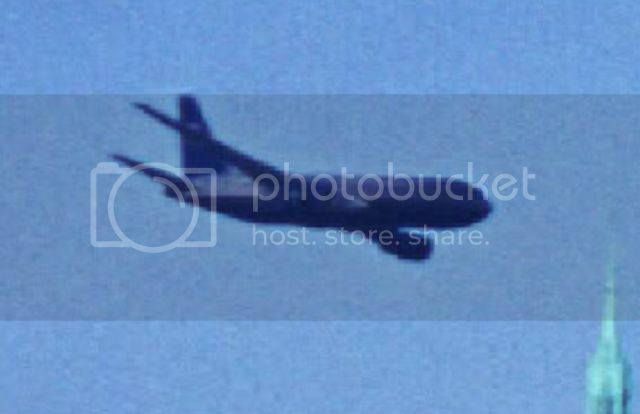 On a real plane there is space between the windows, (AND COMMERICAL PLANES ARE NOT BLACK...LOL) which make them discernible.